16.02 – 7 pm - Now&After`18 closing: announcement of Now&After`18 winners and PURBA T.I.M.E. concert – performance. 10 FEBRUARY from 1 pm till 6 pm - Now&After’18 conference Videomania will be held at RMA business school at Artplay Center. MARISOL BELLUSCI, Argentina. Curator and producer of VideoBardo International Videopoetry Festival; artist and member of the Cultural Art Research Center and Universidad Nacional de las Artes. Dear friends, We are happy to announce Now&After’18 participants! More information will be available soon on our Facebook page and on Now&After website. Now&After team would like to wish you all happy holidays and creative & fruitful New Year 2018! Deadline: December 20, 2017, 23:59 MSK (GMT+03:00). Now&After participates in OSMOSIS Audiovisual Media festival 2017 in Taipei, Taiwan with Ecoscope exhibition. Live broadcasting of a round table from the Pompidou Center dedicated to retrospective exhibition of Fred Forest. Interview wth Now&After curator Video artist Matina Fomenko prior to Now&After’17. Interview wth Now&After curator Video artist Matina Fomenko. We wish you a Merry Christmas and a Happy and Peaceful New Year 2017! Thank you for being with us! We are happy to announce Now&After’16 winners! Now&After'16 Special Program has changed. Now&After takes part in the "Night of Art"
The first meetings within Now&After’16 Special Program will be held October 29 and October 30. Opening of International Video Art Festival Now&After’16 will be held October 27, 2016 at 7 p.m.
We are happy to introduce Now&After’16 jury! Vdeo art project ECOSCOPE which is a part of Parallel program of Photobiennale 2016 will be presented at CCI Fabrika 15.02 - 13.03.2016. Thank you for you patience! We will start Now&After’16 submission in the beginning of 2016. We will give you all the details in the New Year. June 16th,Now&After’15 presents AV-arkki (Finland) guest program Space Tripper. May 28 Round table “Multimedia in Architecture” within Now&After’15 will take place. 19:00 —auditorium of Ruined Wing. May 16 NOW&AFTER participate in special program “Night Vision” within Long Night of Museums at The Schusev State Museum of Architecture. 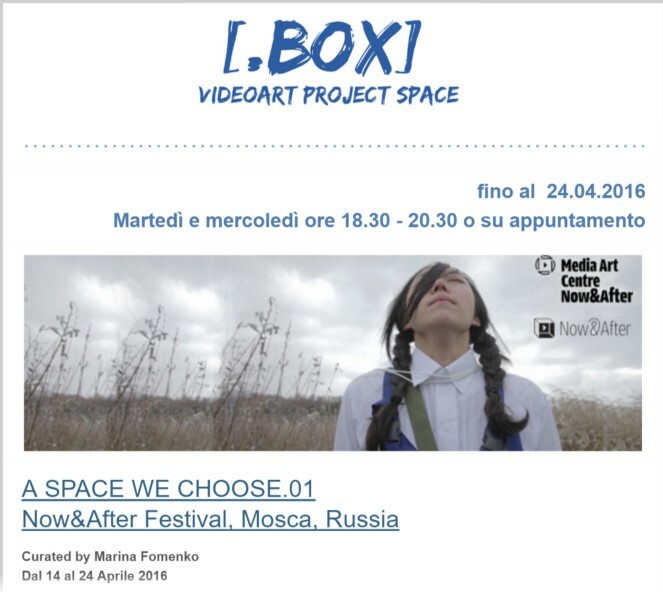 International Video Art Festival Now&After is a guest of CologneOFF X @ 9th The Carnival of e-Creativity (CeC) India - Shillong/Meghalaya/India — 1-3 May. We are happy to present Now&After’15 guests. The guests programs will be showing during all day long in accordance with the schedule on the third floor of the Schusev State Museum of Architecture Ruined wing. The submission is closed. Many thanks to all artists who sent their works for Now&After '15! We received 1046 applications from 67 countries. Thank you for the support! We will announce the festival participants in the beginning of March. The area where video comes in contact with photography – that is what all project’s artworks have in common. June 18, 10 p.m. - Now&After open air screening at the Museum of Moscow summer stage! On the eve of the 10th Anniversary season at the Center for Creative Industries FABRIKA we talked with the curator of the group exhibition "Photo as a video, as the photo" Marina Fomenko. We received 1041 applications from 72 countries for Now&After'14. Thanks everyone who sent us videos! The deadline is over. Thanks everybody who sent applications to Now&After’14! The news will follow soon. We are glad to announce NOW&AFTER’14 OPEN CALL. 1 August: Now&After director Marina Fomenko presents Now&After festival within LOOK! Moscow project. The special selection will be shown. 4/7/2013 - Now& After presents at Festival Miden the collection "Super-super city"
June 13 – presentation of Video Art Festival “Now&After” at Kyoto Seika University, Japan, and screening “Only Winners” collection. May 22, Now&After collection FACTOR OF UTOPIA will be screened at Tsiolkovsky Fest in Kaluga, Russia. We are pleased to announce participants of NOW&AFTER'13, 27 of them participate in competition program and 14 artists take part in non-competition program. The deadline is over. Thanks everybody who sent applications to Now&After’13! We received 848 submissions from 54 countries for the third edition of the Festival. We are going to tell you about results of the selection early April. by the motto «BETWEEN IMAGE AND PERSONALITY». DIGITAL MEDIA ATRS FORUM (DMAF) will take place in St.Petersburg State University of Film & Television, October 16-19. “Now&After” takes part in XIII Media Forum of 34rd Moscow International Film Festival, June 22—27, 2012 in the program “Let’s Rock!”. AWARDS OF VIDEO ART FESTIVAL “NOW&AFTER'12” - CONGRATULATIONS!!! SCHEDULE of Video Art Festival "NOW & AFTER'12"
Deadline: 25 April, 2012 . «Now&After’12» will take place within the period 24 May – 10 June, 2012 in Moscow Museum of Modern Art http://www.mmoma.ru.